DemoCurmudgeon: Paul Ryan to Retire, tells Americans to have "People" (babies), missed the Rise of Robots and a Basic Income!!! Paul Ryan to Retire, tells Americans to have "People" (babies), missed the Rise of Robots and a Basic Income!!! 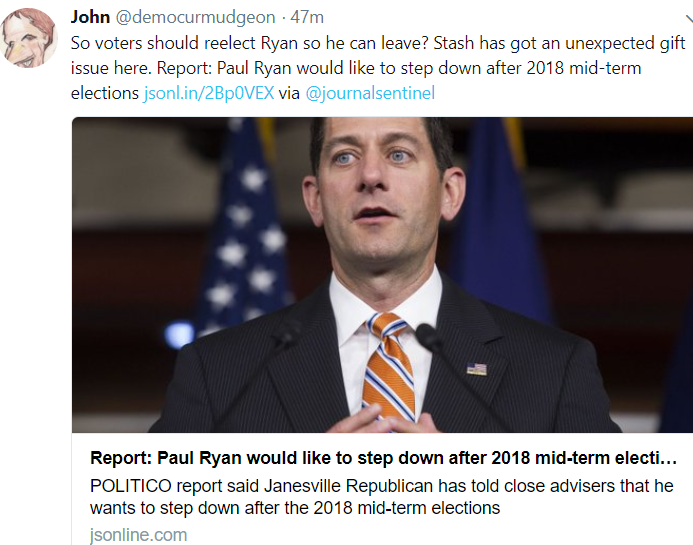 As the story goes, Ryan wants to raise campaign money for other candidates, win reelection, and then step down. That assumes voters are that dumb? He's denied the story, but in the weakest way. People should have...People (babies): Paul Ryan's latest stunning condescending statement about labor? He foresees a shortage of "people," and because we're all dumb as boards and can't make these decisions on our own, he's got some advice; give birth to "people." "Artificial intelligence and automation is going to have a lot of impact on the workforce," said Steve Jahn, executive director of Momentum West, an economic development group in northwestern Wisconsin. "There is forced automation because of forced challenges with workforce." The implications extend from farming and manufacturing to fast food servers being replaced by kiosks, or taxi drivers and truck drivers being replaced by self-driving vehicles. Loan officers, financial advisers, retail clerks and workers in dozens of professions face likely replacement due to automation, according to a 2013 Oxford University study. The Oxford University study found such jobs as lawyers, journalists and teachers to be least likely to be replaced by automation. "It's getting very competitive out there," GEA regional equipment sales representative Rudy Sennhenn said. "It means he either pays up now (to automate) or he's going to lose a good employee to another farmer or he's going to end up paying (the worker) more." The loss of low-skilled, manual jobs to automation is a well-worn tale, especially in a state like Wisconsin with its concentration of agriculture and manufacturing. Wisconsin has 2.5 robots per thousand workers, the 10th highest concentration among the 50 states, according to an analysis of Moody's Analytics data by the Brookings Institution. Between 2010 and 2015, the number of industrial robots grew 124 percent in Wisconsin, only 36th highest in the country. Demand for robots is expected to accelerate as a result of the state's growing worker shortage. In the past few years, (many companies) raised hourly wages from $8 to $10 an hour, but workers are asking for as much as $14 an hour now, a sign of the tight labor market and the economic reality of how difficult it is to live on less. The idea is not exactly new—Thomas Paine proposed a form of basic income back in 1797—but in this country, aside from Social Security and Medicare, most government payouts are based on individual need rather than simply citizenship. Lately, however, tech leaders, including Facebook founders Mark Zuckerberg and Chris Hughes, Tesla’s Elon Musk, and Y Combinator president Sam Altman, have begun pushing the concept as a potential solution to the economic anxiety brought on by automation and globalization—anxiety the tech industry has played its own role in creating. If robots and offshoring take all the jobs, or at the very least displace the low-skilled ones, the thinking goes, there may come a time when there simply aren’t enough jobs to go around. What then? In "What Happened," Hillary Clinton writes that she considered rolling out a basic income policy during her 2016 campaign. In September, Silicon Valley congressperson Ro Khanna introduced a bill calling for a $1.4 trillion expansion of the earned income tax credit, which would effectively create a small basic income for low-income working people via tax credits. And the mayor of Stockton, California, recently announced that beginning in August 2018, the city plans to give some of its 300,000 citizens $500 a month, an experiment being funded by Hughes’s organization, the Economic Security Project. In two studies, one published in 2003 and a follow-up in 2010, Jane Costello, a professor of psychiatry and behavioral sciences at the Duke Institute for Brain Sciences, compared children who were lifted out of poverty after the casino opened to those who had never been poor. She scored them based on the presence of emotional disorders, as well as behavioral disorders, including attention deficit hyperactivity disorder (ADHD). Before the casino opened, Costello found that poor children scored twice as high as those who were not poor for symptoms of psychiatric disorders. But after the casino opened, the children whose families’ income rose (casino payments) above the poverty rate showed a 40 percent decrease in behavioral problems. She found something else: The younger the Cherokee children were when the casino opened, the better they fared compared to the older Cherokee children and to rural whites. This was true for emotional and behavioral problems as well as drug and alcohol addiction. One fear about basic income is that people will be content living on their subsidies and stop working. But a 2010 analysis of the data, led by Randall Akee, who researches public policy at UCLA's Luskin School of Public Affairs, found no impact on overall labor participation. Akee also looked at the effects of the money on education and found that more money in the household meant children stayed in school longer. The impact on crime was just as profound: A $4,000 increase in household income reduced the poorest kids’ chances of committing a minor crime by 22 percent. Note: Spell correct nailed me on "Stash," which should have been "Stache." Heck, just elect Randy Bryce.